Peanut Butter Chocolate Spoons for Valentine’s Day. Ready in 30 minutes. 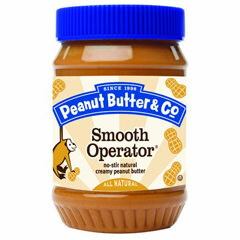 Perfect for peanut butter fans. Lazy people can make fancy chocolate gifts! Be creative with packaging those delicious peanut butter chocolate treats. It’s fun to make chocolate spoons and it’s even funnier to give those spoons to someone you care for. Happy cooking! Cake pops can’t be easier than this! Cream cheese, Oreo cookies and melted chocolate will make a perfect Valentine’s Day gift. No further directions necessary. Just follow the instructions in the video below step by step. It’s the easiest foolproof cake pop recipe ever. Happy cooking! Nutella strawberry chocolate for your Valentine. No-bake, 4 ingredients, ready in 30 minutes. Look, how scrumptious! Perfect blueberry muffin mug cake which is ready in 5 minutes. I love juicy blueberries in this warm cinnamon muffin. Even better than the oven-baked! Rainbow with Clouds Cookies – Slice & Bake! 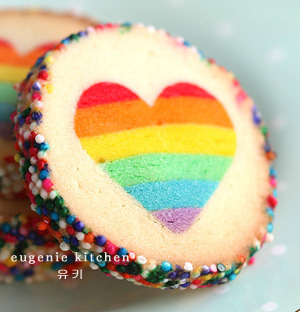 This DIY rainbow on clouds French butter cookie recipe is for any special day. Slice & bake cookie rolls freeze well. Make them in advance for next party. >> Find all my videos here. Do you want to make your cakes or cupcakes very special? Here goes how to make rainbow roses for your next project. You can make beautiful rainbow roses with fondant, marzipan, or even children’s Play-Doh for fun. Fondant rainbow roses are perfect for cake decoration. How about making those little rainbow roses this winter? Thumbs-Up Cookies – Facebook Like Slice & Bake! Here goes another social media Facebook ‘thumb-up’ cookie recipe! I wish you like my new slice & bake cookies.